When we fell pregnant with Munchkin, we were flooded with a complete mix of emotions. The anxiety of what was coming during the next 9 months. The uncertainty of our ability to be 'good enough' parents. The sudden feeling of inescapable responsibility, yet the overwhelming sensation of never wanting to escape it! Above all, the pride and bubbling excitement that would continue to grow throughout the pregnancy and beyond. We were about to be 1st time parents and knew that we needed to consider every bit of advice and support that was offered to us. One of the very important pieces of information that I looked for, especially early on in my first pregnancy, was what to expect from each trimester. I tried to keep a diary each week, recording how I felt, the questions I had, any concerns I wanted to put to the midwife. I found it kept me focused during a time when confusion was high and when tomorrow held nothing but uncertainty. I feel it is a wonderful thing knowing that there are people and organisations out there that will help and support you through your pregnancy week by week, whether it is your first time as parents or you are adding to your existing brood! One online community that I discovered back in 2009 was the pregnancy site Bounty. 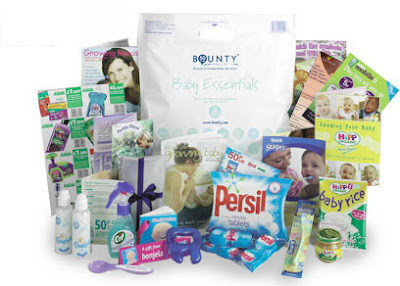 Every expectant mum is introduced to Bounty during the first 'booking in' appointment with the midwife, as part of this session is the issuing of the Bounty Pack! That first pack that will stay with you throughout your pregnancy, right up until you have given birth. It holds your maternity notes as well as all important information you will need to keep with you regarding appointments, blood tests and further support that is available. By the time your baby is a few months old, you should have received/collected a total of 5 packs, each one stuffed full of useful information, contacts, vouchers, special offers and free samples. Please Note - this is an example of the contents of one of the packs. Products and information contained will often change in order to stay current! Bounty offers a huge range of services and support, and best of all, it's completely FREE to register. 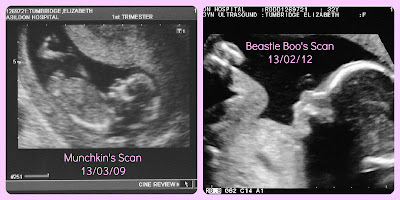 You can track your baby's development from the first trimester of pregnancy right through to beyond toddlerhood, and there is also support for those TTC (Trying to Conceive) You can find advice regarding the ever important baby names, as well as honest product reviews covering many of the popular items used by parents. There are also sections on the website for information about health & well-being, money & work, food & nutrition, lifestyle, relationships and travel. You can also enjoy and participate in some great competitions and involve yourself in friendly debates and discussions. Most importantly, you can meet other parents at the same stage as you by joining in with the chat and banter on the Bounty Forums! There really is so much to do on the site! 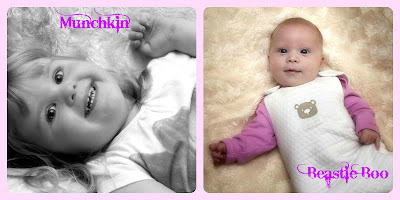 We are now lucky enough to have the two most beautiful girls, and I can still engage with Bounty.com to keep up with all the latest baby & toddler news as well as tracking those all important developmental milestones! Becoming a parent, especially for the first time can be an exciting but worrying time. So register with Bounty.com and let them take some of the unnecessary stress away, allowing you to spend a bit more time and energy enjoying your pregnancy instead. Just remember, it's all over very quickly, so make the most of what you can! Video Review - Getting Festive with Scotch! Fly me to the Sunshine ...! Beans, Beanstalks and Big Burly Giants!